The biggest challenge with the small bedroom is the limited space. The limited space will naturally obstruct the overall room layout and management. If you aren’t sure with what you do, your bedroom may look cramped and lousy instead of beautiful and stylish. But not to worry because there are some projects that you can do on your own. It is basically a multi functional furniture where the closet and the bed can be combined together. Instead of a regular closet, this bed/closet design is unique and it is able to accommodate your items just nicely. So, the overall look is this platform bed – which makes the bed looks taller than the regular type. The big difference is that the extra height from the floor to the bed is used for the storage compartments. You can flip the bed up, revealing an empty spot underneath, perfect for closet. The mechanism for opening and closing the bed/closet is simple and you don’t need to deal with fussy operation. This DIY project ideas may need extra work but you will love the result if you are able to create one. Hold there for a second and play this video if you prefer enjoying this list in a video format. I hope you like it and let’s continue our countdown. Creating this DIY project ideas is easy and pretty simple. The design is pretty straightforward and yet the function is handy. You only need to lean it on the wall and manage your items on the displayed area just like that. Do you want to paint the desk or not? Do you want to keep it with the original color? Do you want to add extra slots? Everything is up to you and your needs. Just keep in mind to build it strong enough to accommodate most of your items. Let’s say that you have bought wall sconces from your favorite suppliers, such as Target or IKEA. In most cases, you have to put up with the already created design. But what if you want to make your own design? It’s a good thing that there are some reliable sources that allow you to tweak the sconces so you can come up with the design that you want. You may need to prepare plastic pipes that are painted in a unique color. Don’t forget about the bolts and nuts. Once you have installed everything, you can have yourself a truly unique wall sconce for your bedroom. When you have limited space inside the bedroom, why not adding ladder construction or stall bars on the wall? Instead of having a closet, which will take up a lot of space, adding the ladder construction or the stall bars won’t take any extra space. You only need to make use of the available empty space on the wall and you don’t need to add another piece of furniture into your room. Bringing in a closet into an already cramped bedroom will only make the bed feel even smaller and more cramped. So, why not making your own open closet? 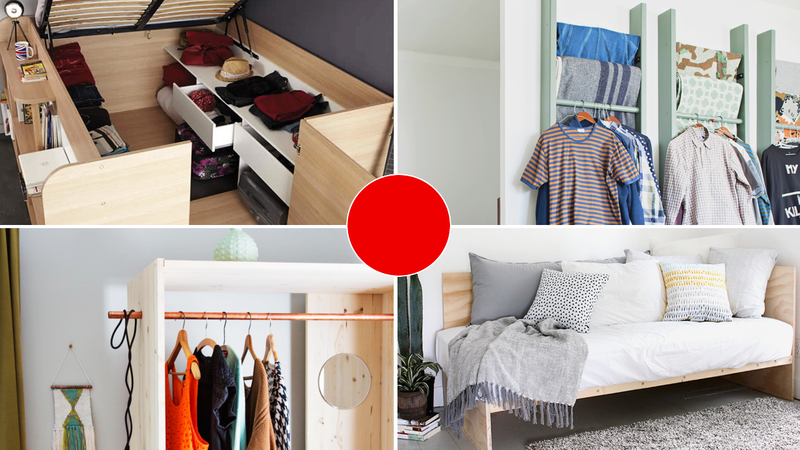 By using plumbing pipes, you can create your own place to hang the clothes and stuff. You only need to choose a specific spot on the room, and then create a construction based on your wishes. Just make sure that you secure the pipes so they should be able to accommodate all of your clothes just nicely. Whether you want to paint the pipes or not, or you want to add accessories to the construction, it is up to you. Most people like to have a nightstand right next to their bed because it allows them to put their favorite items – the reading table lamp, the area to place their favorite readings or books, etc. But what if your bedroom is so small and limited that having a nightstand won’t be enough? No need to worry. Why not having a wall mounted nightstand, instead? When you have this wall mounted construction, no need to worry about the needed space. You are going to install it on the wall, not on the floor so it should be enough. Moreover, this wall mounted construction can be an easy DIY project idea that all homeowners can do. If you have a rather high or wide floor clearance, you can make your own baskets. You can make the baskets from scratches but you can also buy the already existing baskets and then add the wheeled casters so you can easily move the baskets around. Most homeowners forget that the space underneath their beds is often left untouched. When you use the baskets to store items, such as magazines or small Knicks and knacks, you can make use of the extra space. When the baskets are added with the caster wheels, moving the baskets around or getting the access to the basket will be so much easier. If you have unused boards or planks (no matter whatever types of wood they are), you can cut them into pieces and then try to assemble them together. By doing this, you can create your own modern wardrobe. This plan is for the open wardrobe, but in case you have an elevated skill, feel free to add doors to the construction. Once you are done with this wardrobe, you can paint it or leave it just the way it is. This open wardrobe is pretty slim and compact, and it is perfect for corner construction. Another clever DIY project ideas is to include storage compartments within the bed. A platform bed allows extra space underneath the bed, enough to accommodate your items. You can place clothes, bedding items, etc. When you have such extra compartments within the bed, you don’t need to have any wardrobe or other pieces. Whether you have a small single bed or a big and wide bed, having the compartments along with the bed will improve efficiency and functions. Detail Here! If you have limited space bedroom, have you ever thought about having a corner bed? If you can’t find one at the home improvement stores, why not making one by yourself? This corner bed is pretty easy to fix and it helps with better management for the bed. When you are able to place the bed on the corner, you have maximized the layout and room arrangement, creating enough space for other items. Some homeowners prefer unique pieces than the mainstream constructions. For instance, instead of buying the regular working desk, they like to have two stairs or ladder stairs and then connect them with a plank to create a unique working station. Whatever options you choose, be sure to pick a style that truly represent your characters. Only by doing so, you can improve the style inside the bedroom without compromising functionality and usage. In short, there are pretty many creative DIY project ideas that you can actually do without spending a fortune. This is 25 Ways to Store Shoes in Your Closet by HGTV, if you can’t watch video under this sentences, that means you’re reading this post in amp format. My advice is refresh this post in your desktop.